KENLY, N.C. — We were not feeling as adventurous on the way back north as we had been on the way down, so we didn’t stray far from I-95 for our final meal of the drive. Moore’s barbecue, located next to the exit 107, gave us the convince we wanted, but would it deliver on food? The answer — sorta. Moore’s has a pleasant dining area that you set yourself in after ordering food cafeteria-style. 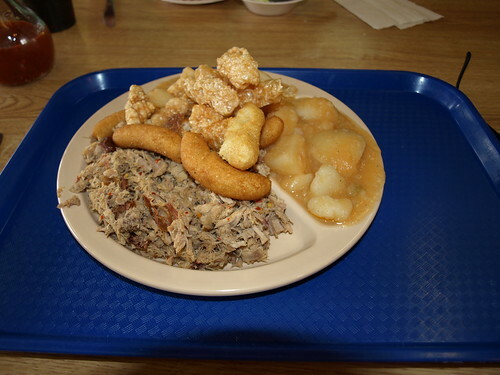 I went ahead and got a plate of pork, potatoes and hushpuppies. Pork rinds were thrown on top of the plate, but “being-gastronomically-honest-to-the-local-cuisine” be damned, I’m not eating pork rinds! The pork was tasty, though not as tender as Parker’s, the place we ate at on the way down. Moore’s uses more peppers, so it has a bit more zing. I enjoyed it as it came and with the pepper sauce. The potatoes were pretty good, though a few were overdone, and the hushpuppies were fine. Erica had another pork sandwich this time and enjoyed it. 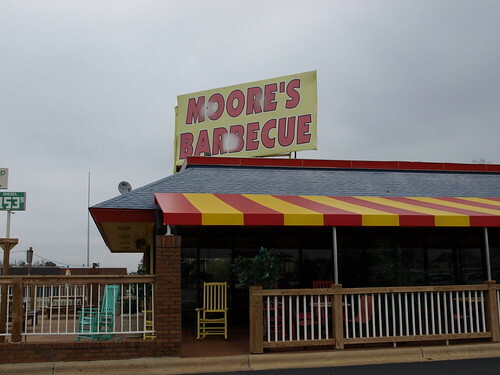 I was enjoyed Moore’s and would go there again, but I wouldn’t go out of my way for it like I did with Parker’s. Moore’s convenience from I-95 meant good barbecue was good enough. I’d be quite happy to have barbecue of this caliber in my neighborhood. 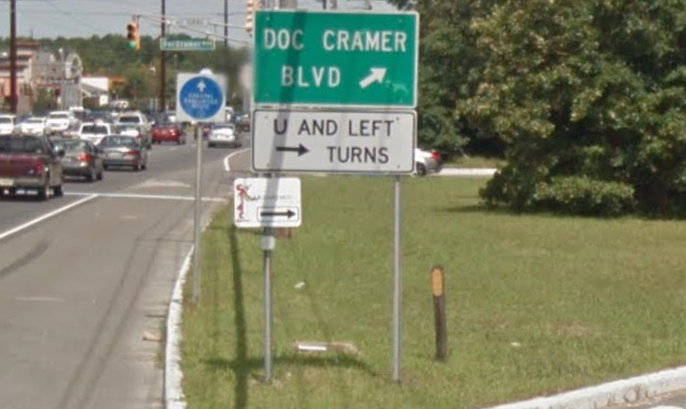 Why is it called Doc Cramer Blvd?